Photo by Jens Gresling, downloaded here. What a feeling Cavendish must have felt as he crossed the finish line in Copenhagen first on Sunday, after all that hard work by his teammates and after three years of systematic work towards this historical goal. Moments like these are what I truly love about sports in general; all the hard work pays off, drama and emotions all over. 46 years has gone by since Simpson wore the rainbow jersey. Did I hear a "Cycling's coming home"? Had a discussion with a close friend on Sunday, who was sad to see "panache out of the door" as the person said. "A world Champion should not need to be carried to the finish line, but honour it the way the best rider in the world should", the person continued. Personally, I know I'll miss seeing the rainbow jersey attack furiously up the Alps or the Dolomites, the strong solo win Hushovd did during the tour was nothing short of spectacular, as was Cadel Evans' year as WC. However, my view is more divided. As I mentioned earlier, sports is all about improving, and I mean every way possible. Generally speaking, every person on a team bring something to the table, something slightly different than me or you. That is why teamwork is a recognised way of performing a task (even though other people can be annoying at times...). Change is almost never easy to withstand and in sport, it comes and goes in waves almost continuously. Who wins is of course depending on the WC course. Despite that I really enjoyed watching the rainbow jersey set colour to the last two seasons, I believe Cav will do the same, his way. I brought this up with Rich Land (@Sprinting4signs) on twitter, and he most graciously wrote that "each World Champ brings something new". 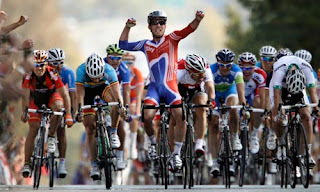 I totally agree with this, and cant wait to see Cav sprint next year. The last years cycling has been blessed to have giants as World Champs, so Cav is in good company and has some shoes to fill. As it should be, I must add. His first words after securing the win, that he'll honour the jersey, is a sentence that probably spoke directly to the hearts of many cycling fans. If (when) Cav goes to Team Sky, what will this mean to the set-up and the team's goals? That is another question worthy a post of its own. Let's first see if Pinarello is thrown out the back door for Specialized. Steve; a British owned team on British bikes would make wonders for BC towards the Olympics, wouldn't it? In the end, I think it all comes down to the cash, Cav's got some market value now and can use it to influence.